The octagonal shaped, two story bandstand in Marshall has had many lives and yet it has remained the same design and served much the same purpose over time. First located in 1895 on Main Street next to the hotel, it was the hub of the village until 1965. Bands played regularly during the summer. Until 1911, band members were paid 50 cents per concert from funds solicited from local businessmen. From 1906 to 1922, the lower level, complete with a wood burning stove, was used for fire department meetings; it also was used for bake sales, ice cream socials, and as a polling place. In 1965, the bandstand was moved to the Jack Skalitzky Jr. farm when a road was built where it stood. ​In anticipation of the 1976 Bicentennial celebration, the bandstand was brought back to the village in October 1975. It was a gift from the Jack Skalitzky Jr. family to the citizens of Marshall. Henry Wild, Jr., and Stan Haakenson oversaw the move and were assisted by the Marshall High School agricultural instructor Paul Prust, FFA members, and Jim Maly who drove the Midway Equipment, Inc. truck. The bandstand was restored by volunteers from local citizens and high school students in time for the dedication in September 1976 in Firemen's Park, A time capsule was placed in it to be open in 100 years. ​In October 2006, the bandstand once again moved, first for its restoration at Best Built Garage Builders and then to Triangle Park, in the center of the Village. Donations provided funding for its restoration, including a new roof and siding, painting and landscaping. It was ready for the annual Christmas tree lighting in December 2006. The time capsule was also moved to the new location. The name of the park was changed to Veterans Memorial Park sometime after 2006. ​Currently, no music is scheduled at the bandstand. ​Veterans Memorial Park is a one-half acre community Park located on Farnham Street. The Park is home to the Village's historic Bandstand. 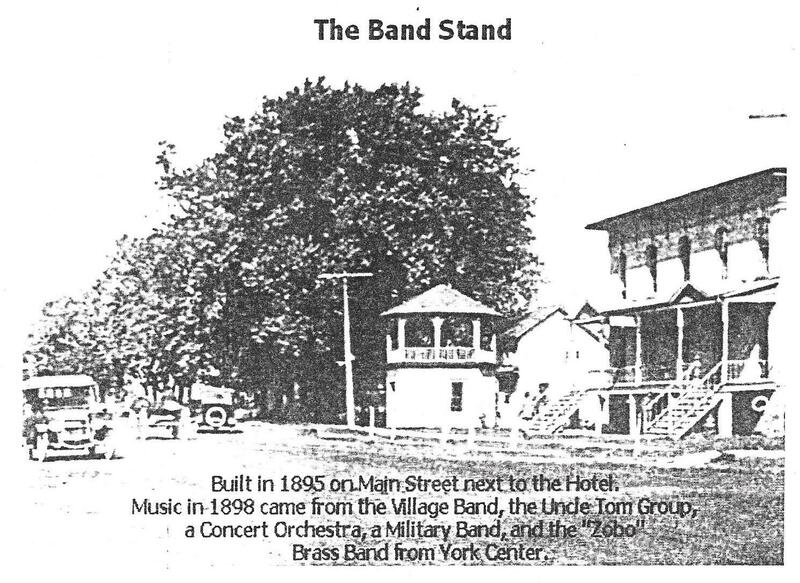 In the late 1800's the Bandstand was located on Main Street and often you would find local musical talent entertaining the community. Veteran's Park is a place where one can come to honor those past and present who have served our nation. Memorials are in place to honor those, from Marshall, who gave their lives in the Civil War, World Wars I and II, the Korean War and the Vietnam War. Please take a minute and stop by for a peaceful moment while paying tribute to the loved ones lost during these times.